Located on the crossroads between the vineyards of Cannubi & Brunate, in the frazione of Crosia Ponte Rocca, the Francesco Borgogno family has been making wine since the 1930s. The family first bottled their Barolo in 1970, with the inaugural Barolo Brunate being released in 1974. The traditional label features a colomba/dove (of peace), designed by Francesco Borgogno himself as a result of his (Second World) wartime experiences. His family narrowly escaped being shot by the Nazis on 15th March 1943 thanks to the intervention of (9 yo) Francesco’s father in persuading the German officer to act otherwise. Francesco Borgogno & his wife Giuseppina (nata Alessandria of Santa Maria, La Morra) have two sons Claudio & Giancarlo. Claudio is the winemaker & is married to Silvia Viazzi of Monforte d’Alba, a family famous for growing fine Barbera fruit in the frazione of San Sebastiano. Giancarlo is largely responsible for the vineyards. The Francesco Borgogno family has 7ha in total, of which 2ha lie in the very heart of Brunate vineyard, in the commune of La Morra, on white Marne di Sant’Agata clay soils. From vintage 2013 they are also releasing a Barolo Castellero, from 2 hectares of rented vineyards in the commune of Barolo; here the soils are distinctly giallastro/sandier, plus some grey marne from the Vignane parcel – on the bivio/junction then between Barolo, Castiglione Falletto & Monforte d’Alba. All the vineyards appear to have been planted in the 1970s. Dolcetto is grown in the La Morra vineyards of Berri & Fontanazza, while the Barbera comes from Silvia’s family in Monforte. The (Langhe) Nebbiolo from the cooler, NE facing slopes of their Brunate vineyard. The Dolcetto, Barbera & Nebbiolo wines are made using only static stainless-steel tanks, while the Barolo Castellero & Brunate are vinified for up to 40 days on the skins (submerged cap) in a combination of stainless steel, cement & botti grande. Recent years has seen investment in new botti & winery equipment, along with the removal of herbicides, to create an even purer expression of their traditional wines. From vintage 2014, the family have reverted to releasing a traditional Barolo, blending Brunate & Castellero together under the one label. 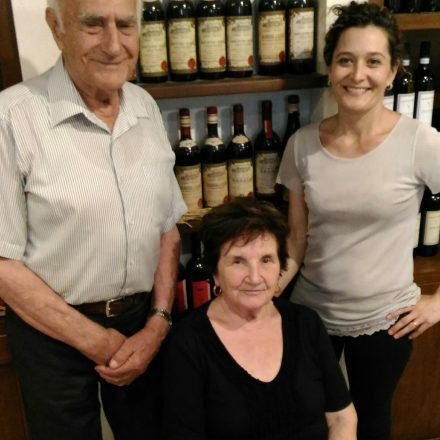 2015 Barolo – 14.5%, tasted March’19, bottled Feb’19, in this vintage the family chose to blend both the Castellero & Brunate vineyards into one, classic, Barolo. Emphatic, broad, transparent red garnet, the nose is composed, intense, with a distinct Brunate whiff of dark truffles, of mentholated, forest floor, autumn litter fruit. Cologne fresh, there’s a riper, pretty red fruit character & sense of Castellero too. Indeed, while the nose currently belongs to brawny Brunate, it’s on the palate where Castellero’s peachiness comes through even more. Composed, the palate has presenza, ciccia/flesh & the square, tannic structure of Brunate, while the sunny red-fruited charm of Castellero brings a smile on the finish. For as Francesco’s son, Giancarlo Borgogno remarked: “it was Bartolo Mascarello who reminded me that a blend is quite often the best”. 2013 Barolo Castellero – bottled June 2017 (c.80 mg total SO2) & tasted 25 Oct. 2017; the family’s first release – a ‘sorellina’ to Brunate’s ‘fratello’! Blending together 85% of Castellero & 15% Vignane vineyards. Both vineyards lie adjacent to each other. Castellero is a 200metres asl low hillock lying halfway between Barolo & Castiglione Falletto, just down the hill from Villero, on ‘giallastro’ sandy, calc clay soils; both plots are only a kilometre away from the winery. Vignane invece sits slightly further up the ridge on distinctly lighter, grey marl soils that are so typical of Monforte d’Alba up the hill; so Castellero provides the soft sunny fruit/flesh, while Vignane provides the spine. Both planted in the ’70s, so a good age now. Stainless-steel fermented & macerated for c. 20+ days, then aged for 36 months in new 30HL slavonian Garbellotto botte, submerged cap at the end, & (crucially) followed by cement prior to bottling. Pale, bright, clear, rose red; delicate, perfumed, suave, peach skin scented (like Villero! ), dried rose; to taste, it’s refined, refreshing, alive, lots of juicy, pretty red fruit, very fine, ethereal tannins, along with a distinctly lampone/raspberry fragrance (pointing to Castiglione Falletto), & sunny suppleness, as you would expect from a Barolo from the village of Barolo. Very pretty but shy, covering up. Claudio remarked that Castellero is quite exposed, & being relatively low down, there’s a need to protect the fruit (& aromas) from the sun. No sense of the 14.5% abv, thanks I suspect to the salty Vignane fruit from Monforte. Note the bright, light label (compared to Brunate’s brooding dark one)! 2013 Barolo Brunate – bottled in June 2017 at 76 mg SO2, tasted 25 Oct. 2017; very much the elder brother to ‘baby sister’ Castellero, brawnier too at nearly 15% abv. The reason being the poor, (sun reflective) notably white, calc clay Brunate soils that lie on a steep gradient facing full south right in the heart of this famous La Morra vineyard; a vineyard famous for generating great heat during the day & cooling down quickly at night, hence producing prodigious, darker fruit with thick skins (until the delicate thinner ones in Castellero). Their two plots lie below Ceretto’s, planted again in the 1970s, within the comune of La Morra; close to the cantina in fact. Darker, more intense in colour; the nose is brooding with that inimitable Brunate whiff of earth, white musk, rose, dried orange peel, tamarind, cologne fresh notes, but at its core ripe brambly fruit. Compared to Castellero – which Claudio is very pleased to be able to do – Brunate has a fuller earthier, more autumn leaves character to it, perhaps framed by the use of older, 30HL slavonian botte. It’s got more muscle, presence too, compensated by the richer, dried, tobacco leaf & sandalwood fruit; there’s a thickness (to the skins), a richer glycerol dry extract vs. the rosewater character of Castellero. Fascinating to see them side by side! Needs more time perhaps, while Castellero is irresistible now! 2012 Barolo Brunate – distinto, cologna, verticalita, lift, brambly core, min serralunga, incenso, i earthy/cigar leaf, etereo come Serralunga, dry rose petal, potpourri, limpido e distinct ph baso refreshment. Suave, tonico acidita, rosa, terra bianca, ph basso, sucuso, yet energetic, tannini finissimi, salato.